Welcome to Wednesday - the middle of the week already! 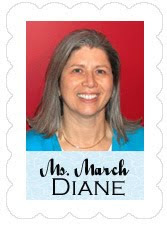 This is Diane, "Ms. March" and your Guest Designer for a few more days. I want to thank you all for the comments you have been leaving. If is rather overwhelming to try to read through all of them but I have been doing my best. There are two things I have noticed in the comments that I want to respond to. Some people have mentioned that they are intimidated by vinyl and haven't tried it yet. I challenge you to move past that fear! The Cricut machine is actually based on commercial vinyl cutters and I find that it is easier to cut vinyl than paper - particularly if you are trying to cut tiny items. In fact, I have used vinyl for lettering or small images on paper projects when I think they will be too difficult to cut in paper. You can cut vinyl in any Cricut machine and you do not need the deep cut blade. A newer sticky mat is best to hold the backing paper firmly. Be sure to smooth out any air bubbles when you place the vinyl on the mat. Remember, to "kiss cut" the vinyl (cutting through the vinyl but not the backing paper), try using medium pressure, medium speed and blade depth 4. Just go ahead and try it and then you can start discovering all of the great possibilities - such as putting words on your walls and etching glass. The other concern that I have seen is that people are not comfortable with using the Design Studio software. 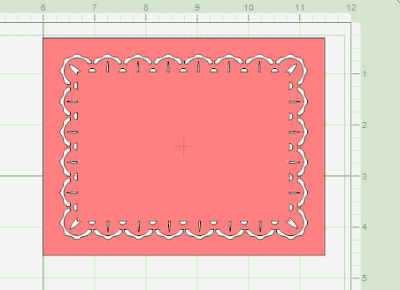 I firmly believe that everyone who owns a Cricut should have Design Studio in their crafting toolbox. You can download the free trial version to try it out. When you use Design Studio you start to look at your cartridges in new ways. You will find all sorts of possibilities for making your own creations by combining and changing the standard letters and images available on the cartridges. You can save money and time and create totally unique projects. 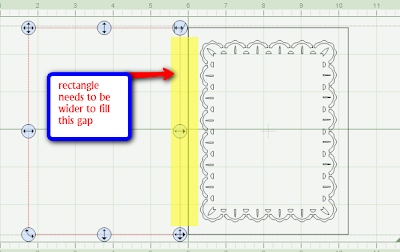 Today, I am sharing directions and a file that you can cut with the trial version of Design Studio and the Expression. 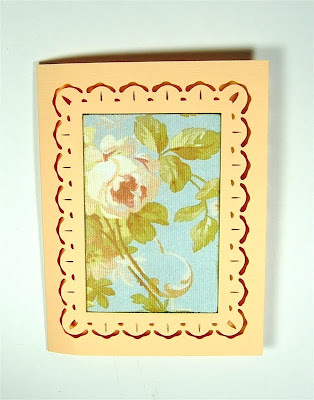 With the trial version you can cut with the "native" cartridge for each machine (George for the personal Cricut or "baby bug," Don Juan for the Create and Plantin Schoolbook and Accent Essentials for the Expression). 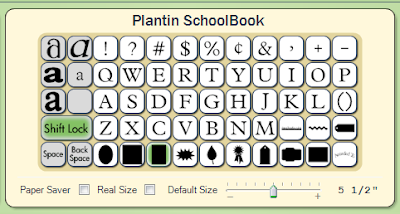 If you have the full version of the software and the Plantin Schoolbook cartridge you can cut this file on the baby bug or the Create. This card design is a personal favorite and one that I have not shared until now - I hope you like it! 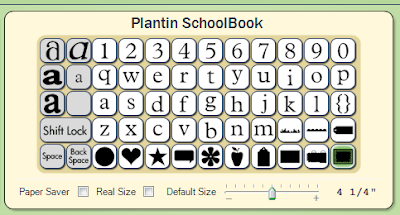 This image on the Plantin Schoolbook cartridge is a certificate. I noticed it when I first got my Expression machine but didn't have a need for a certificate. Once I got Design Studio I saw the image in a new light! Here is the image as it appears on the mat when you enter it at 4.25 inches high. It is already nearly perfectly sized for an A2 card. While the image is selected (with the "handles" around it) rotate it 90 degrees by clicking the "90" in the Shape Properties box. Then enter these values, X (6) and Y (5.8) in the boxes to position the image to create a card front. 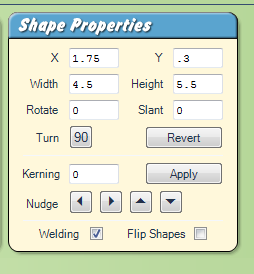 Finally, check "weld" in the Shape Properties box. 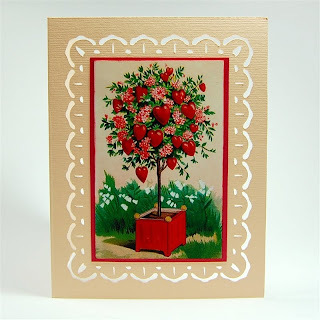 Now you need to add a rectangle to form the back of the card. Change the default size on the slider bar to 5.5 and place the rectangle on the mat. The proportions of the rectangle are not quite right to form a card. The A2 card will be 8.5 inches wide before folding so the left side is placed at 1.75 inches on the X axis - leaving a gap. You just need to widen the rectangle to meet and overlap with the certificate, either by using the handle on the center right or by entering a larger number for the width in the Shape Properties box. Here is what the Shape Properties box should look like when the rectangle is selected. 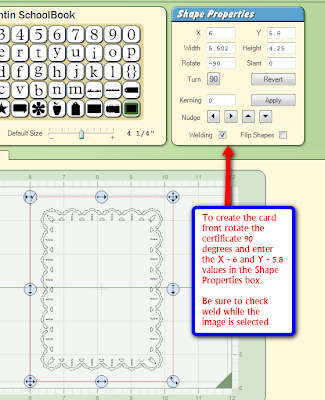 You need to be sure to check "weld' so the two pieces will cut as one card. When you preview the card on a blank page (marked "preview page" in the file) it will look like this. 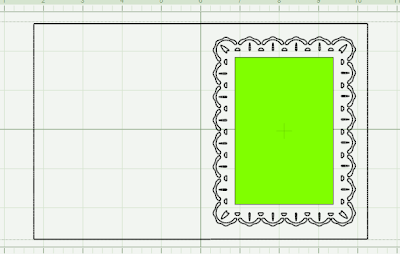 I added an extra page to the file with a rectangle properly sized for the patterned paper on the front of the card. The measurements are 2.5 inches wide and 3.75 inches tall. Here is the card after cutting - you just need to score it at 4.25 inches. 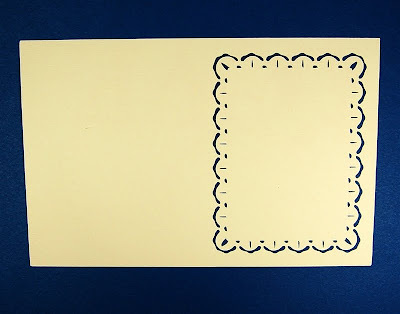 Take care when you fold the card so that you do not bend it in the lacy cut out area. 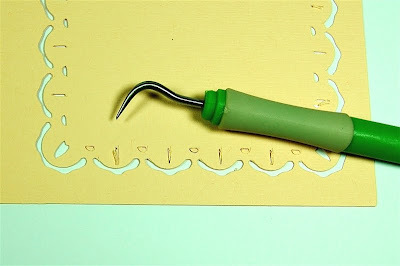 This tool from the Cricut tool set is handy to push out any cut bits of paper that are wedged in the openings. I cut this card in heavy Bazzill cardstock and the cuts were all fine. Here is another view of the card flat on the table. You can add anything you like to the card front. I cut a piece of patterned paper from a K & Co. Wedding mat stack to fit. The edges are inked with Hint of Pesto VersaMagic chalk ink. 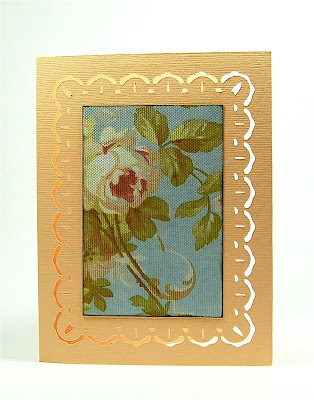 I thought this would make a nice sympathy card with a stamped or cut sentiment added to the front. I like the lace effect but you could add a piece of contrasting paper as a liner if you prefer that look. Here is another version of the card that I made around Valentine's Day. The image is one that I downloaded from Twisted Papers, which is one of my favorite sources of great vintage images. They have a few free downloads every month and their prices are very reasonable so you may want to visit the site and take a look around. If you are an Alice in Wonderland fan, you will find a nice set of the original illustrations for sale and a few free color images that you can download. This is a very versatile card template - I hope you enjoy it! Whew! 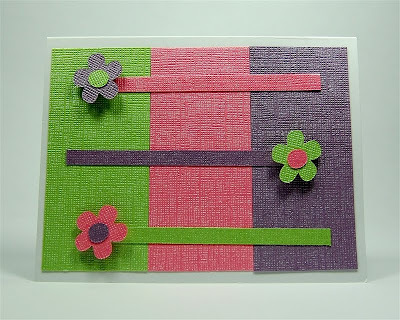 If you made it this far, here are a few cards to provide some inspiration to use your scraps! 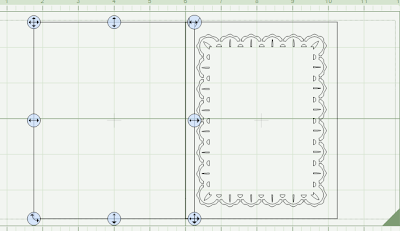 Those of you who regularly read my personal blog (Capadia Designs) know that I always try to make the best use of my paper by planning the layout of my cuts and saving nearly all of the pieces left after cutting. I can then use these to make additional projects for little or no extra expense. 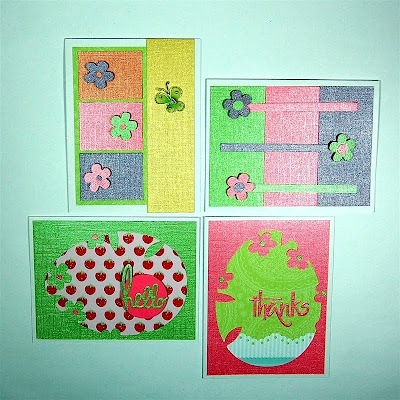 Here are four cards that I created with some of the pieces of the gemstone Core'dinations cardstock I used for the cards I shared on Monday. This could be a notecard or you could add a sentiment along any of the lines. 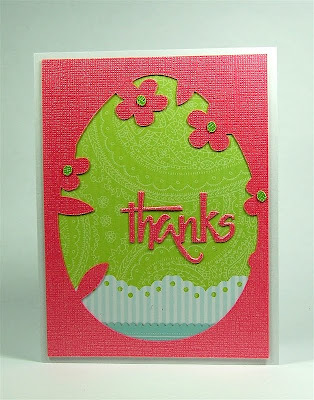 I used one of the egg "frames" to create this thank you card. 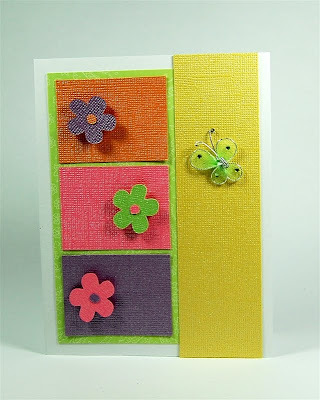 Another color blocking card using some strips and flowers (and a butterfly embellishment). 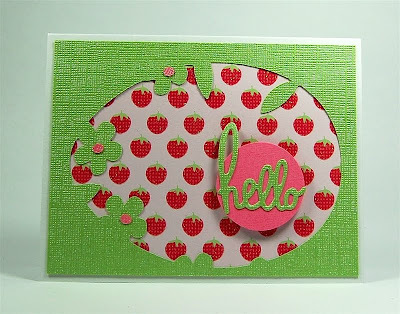 The strawberry egg is a cheery "hello" card for a friend. The full details for these cards along with some helpful tips are in today's "sister post" to this post on my blog - here is a LINK. 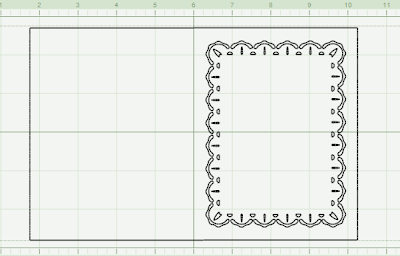 You can also download the .cut file for the Lacy Border A2 card on my blog. One of these days I am going to cut Vinyl-- I have it but haven't yet, thanks for the helpful hints.